We are a leading React development company in India building dynamic, attractive, feature-rich, and secure web and mobile applications. 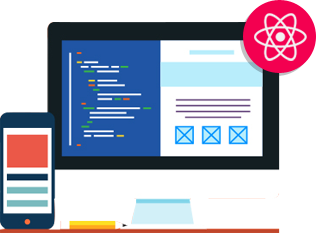 Whether you want to build a new web or mobile application or integrate React into the existing one, our expert ReactJS developer craft the best solutions for you. Our premier React web and mobile application development services build robust, attractive, SEO friendly and secure web applications at reasonable rates. Our ReactJS services help to build Single Page Applications that can load a single HTML page and update it dynamically as and when the user interacts with the page. The SPA is responsive and does not require constant page reloads from the server. This makes the page consume less bandwidth and remains lightweight. Avail our dynamic React services to develop effective and efficient SPAs. The React development process creates a virtual Document Object Model or virtual DOM in the form of a data structure (read node tree) that lists elements as objects. This renders the updation of virtual DOMs faster by the combination of an efficient update of the node tree and observables to find the modified components. React makes it easier to create interactive UIs and updates the right components when the data in your SPA changes. The declarative views enhance the readability of your codes besides rendering them easier to debug. The expert React developers at Webguru create engaging and quick loading UIs enabling a seamless browsing experience. React helps to create a self contained library of modules called components to render each and every part of the web page. These structured and secure components are able to manage their own state and can be reused at will. This leads to a faster development and maintenance of the web application. React speeds up the user interface without requiring any effort to optimize its performance. Our ReactJS development services use an application architecture called Flux controls to update the page view for the user as well as control the application workflow. The web and mobile apps developed by Webguru, the premier ReactJS development company using the React framework are lightweight and compatible with all modern browsers, operating systems and devices. As a leading React web and mobile app development company, the ISO 9001:2015 certified Webguru Infosystems understands your business needs and delivers robust, feature rich and secure web/mobile applications within the turnaround time. Talk to our expert React web and mobile application developer about your business requirement. We will be happy to deliver a great online experience for your customers. The rapidly changing digital landscape requires the building of rich and engaging frontend web applications quickly and efficiently. This needs choosing a framework that is simple, easy to use/reuse, flexible, and allows minimal coding. Among the many open source frameworks available, React aka ReactJS or React.js fits the bill perfectly to build robust, attractive, feature rich, scalable, and secure Single Page Applications (SPA).